The CoffeeShop Blog: CoffeeShop Thumbelina Lightroom Preset! Today I am posting a new LR4&5 Preset, CoffeeShop Thumbelina. This is one of a series of fairy-tale inspired presets. You can see the rest of them here. I took some new flower photos on one of our nature walks last week, and I ended up writing this preset to use on them. How do I write presets? Pretty much how I write actions. I start with an image I want to edit and I play around with the settings until I like how it looks. I save my edit as a presets and then run it on a few other things to make sure it is not a one-hit-wonder. I think this preset looks lovely on flowers and forests, but it can also be used on portraits. 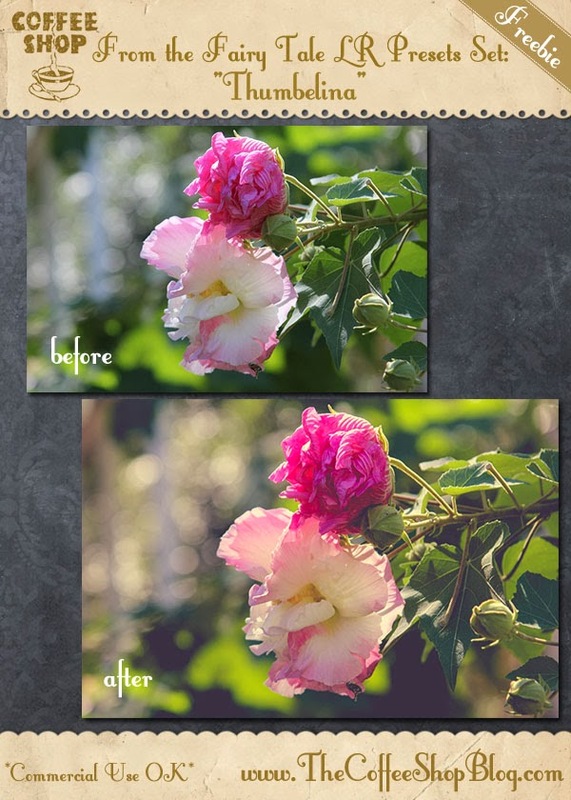 I also wanted to let you know that I am now including my newest favorite LR4/5 presets in my download packs. I know many of you are like me and have Photoshop/PSE and Lightroom. Download the free CoffeeShop Thumbelina Lightroom 4/5 Preset. You can also download it here. Thank you so much for this preset. I use LR5 exclusively now and rarely open PSE. I've always loved allll your presets.